The Pokémon universe (ポケットモンスター, Pocket Monsters) refers to the Super Smash Bros. series' collection of characters, stages, and properties that originate from Nintendo's immensely successful Pokémon media franchise. Pokémon is one of Nintendo's two most lucrative franchises, reaching only behind the Mario franchise in global video game sales and cementing its success outside of gaming via animated series, manga and merchandise; as of December 2016, Pokémon is the highest-grossing media franchise of all time with combined global sales of 6.0 trillion Japanese yen (55.15 billion USD). Thus, a rather large proportion of each Smash Bros. game's primary content is themed after the Pokémon series, and many of the other eponymous Pokémon creatures have made smaller cameos appearances elsewhere. Counting all Smash Bros. games' rosters together, more Pokémon have been playable characters than most other represented franchises: Pikachu, Jigglypuff, Pichu, Mewtwo, Lucario, Squirtle, Ivysaur, Charizard, Greninja, and Incineroar. In Super Smash Bros. Brawl and Super Smash Bros. Ultimate, Squirtle, Ivysaur, and Charizard were featured as a set of freely interchangeable combatants collectively represented by the character choice Pokémon Trainer. 7.20 Pokémon: Let's Go, Pikachu! and Let's Go, Eevee! 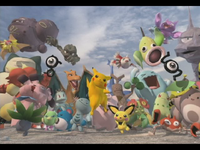 Many Pokémon making cameo appearances in the opening movie of Melee. In the early 1980s, video game enthusiast Satoshi Tajiri began writing and selling his own magazine series known as “Game Freak.” He would be joined by artist Ken Sugimori and together they eventually took up the task of making video games themselves. Game Freak was officially founded as a game developer in April 1989 and would work on a number of unrelated titles for the Famicom and Super Famicom from 1989 to 1994, effectively making them a second-party developer for Nintendo. It would not be until February 1996 that Nintendo and Game Freak saw unprecedented success in Japan and overseas with the release of two games. Pokémon was introduced in Japan as "Pocket Monsters", a Game Boy JRPG that came in slightly modified Red and Green editions that both made then-original use of the Game Boy's link cable between separate systems in that, rather than being strictly used for competition, it was additionally used for trading between players. Nintendo did not expect these games to be a large success, even less so in the West than domestically, but the games - branded Pokémon outside of Japan - took both sides of the Pacific and Atlantic by storm and quickly established the series as a blockbuster, multi-billion dollar franchise. The main JRPG series paved the way for a merchandising empire, including an extensive anime continuity, several series of manga, a bestselling trading card game, spinoff video games touching upon many other genres, and a live-action feature film. Pokémon has become the second biggest-selling game-based media franchise of all time, only behind Nintendo's Mario franchise; as of March 2013, cumulative sold units (including home console versions) have reached 245 million copies. As a direct result, Pokémon has been a mainstay in the Nintendo-centric crossover fighting games Super Smash Bros. since the series started in 1999. In the various incarnations of the Pokémon universe, the world of Pokémon is an Earth-like world inhabited by many species of the eponymous Pokémon creatures which coexist with humans. The Pokémon are colorful, sentient, sometimes sapient creatures possessing the abilities to perform amazing talents of seemingly every conceivable sort, examples of which are breathing fire, expulsing poisonous smog, summoning rainfall, performing martial arts, using illusion to split up into multiple copies of itself, employing psychokinesis, unleashing paralysis-inducing electricity, etc. Many Pokémon live as wild animals both as predators and prey, while other individual Pokémon are immensely powerful beings that the world's human denizens superstitiously attach a variety of creation myths to, and others still are man-made. Unlike the main RPG series itself, where all Pokémon make animal-like grunts and vocalizations (except for Pikachu in Yellow and the sixth generation onwards and Eevee in Let's Go Pikachu & Eevee), most Pokémon in the anime freely communicate with each other in an exclusive language that consists entirely of them reciting their own species names, but some can communicate in human tongue through telepathy (e.g. Mewtwo), and in extremely rare cases a Pokémon can master the ability to speak the physical human tongue (e.g. a particular Meowth). This is retained in various spinoff games, such as the Super Smash Bros. series itself and Detective Pikachu, as well as other media such as the Detective Pikachu live-action film. As of the present "seventh generation", there are 809 recognized species of Pokémon, a fair portion of which are known to have multiple, distinctive forms. The concepts of the Pokémon setting, in whatever incarnation it takes or what kind of media it is depicted in, stem from the hobby of insect collecting, which was a popular pastime which Pokémon executive director Satoshi Tajiri had enjoyed as a child. In most depictions of Pokémon, humans of varying interests seek out and capture various and multiple species of Pokémon using specially designed mass-producible tools called Poké Balls. In most cases, a Pokémon caught from the wild by a human willingly joins up with the human and obeys his or her spoken commands. Some catch and own Pokémon as friendly pets and lifelong companions and do not participate in any competitive activities with them. Others of a less savory nature, such as members of Pokémon crime syndicates such as Team Rocket, capture Pokémon and use them as living tools to advance their evil agendas. Most humans, however, including players of the Pokémon RPGs, take on the occupation of Pokémon training; they catch and collect Pokémon to train them and battle the Pokémon of other trainers in officially sponsored competitive Pokémon matches. There are never any lasting, bloody wounds or deaths incurred by the creatures involved, and seemingly never any hard feelings between winners and losers. The Pokémon Trainer and his team in Ultimate. In the main Pokémon games, trainers can build a team of up to six Pokémon at once. The two-stage object of most Pokémon RPGs is to collect all of the available Pokémon species in the region where that RPG takes place in, and from them train a winning team of powerful combat Pokémon to defeat the professionally trained Pokémon teams of that region's strongest trainers. The player's quest always takes him or her across the region to battle eight specialists in Pokémon training, that region's "gym leaders", and once eight commemorative badges have been gathered, the player may then go to the region's Pokémon League and battle an elite group of trainers - that region's Elite Four - and then battle the regional Champion to take the title. These five trainers, which must be battled one-after-the-other with no rest in between, are almost always the game's equivalent to any other RPG's "final boss" challenge. Pokémon captured from the wild with Poké Balls accumulate experience and learn new combat moves by battling many wild Pokémon and challenging other trainer's Pokémon to Pokémon matches, and whenever a Pokémon falls in battle ("knocked out"), it is easy to quickly and completely restore it to health, free of charge, by visiting one of many Pokémon Centers located throughout a region. Many species of Pokémon, when they gain enough experience and regardless of whether they are in the wild or under a trainer's ownership, undergo a metamorphosis and "evolve" into a similar, but larger and more powerful, species of Pokémon. Many of the 809 species belong to such lineages, and therefore many of the species of Pokémon are effectively different stages of what can be said to be several hundred "families" of Pokémon. In 1996, the First Generation begun the franchise with the Pokémon Red and Green versions in Japan and Pokémon Red and Blue versions internationally both for the Game Boy, with the first 151 Pokémon species and the first-known region of the Pokémon world, the Kanto region. Generation I can be well considered for setting the standards for every future generations to come, including a storyline, a professor, a villainous team with world dominating goals, and choosing between three starter Pokémon. However, the first generation is also criticized for many balancing issues, such as its numerous glitches that are exploitable and Pokémon with little variety in their movesets. Only this generation was in effect when Super Smash Bros. was developed and released in 1999, so Pokémon, locations, and properties from the first generation are featured in the game. In 1999, the Second Generation was heralded by the release of the Pokémon Gold and Silver sequel versions for Game Boy Color, which added 100 new Pokémon to make for a total of 251, along with the new Johto region. Generation II has received critical acclaim from many fans of the series for fixing many issues that plagued Generation I as well as introducing many innovations that will be used in many generations since such as breeding and having legendary Pokémon more involved with the plot of games. In 2001, Super Smash Bros. Melee was developed and released during this generation, so the game features content based on both existing generations at the time. In 2002, the Third Generation took effect with the release of the Pokémon Ruby and Sapphire versions for Game Boy Advance, set in the Hoenn region, which added 135 more new Pokémon and raised the total to 386. In 2003, Pokémon FireRed and LeafGreen, the remakes of Pokémon Red and Blue, were also released. With the complete overhaul from Generation II, the third generation was initially criticized for its lack of backwards compatibility which prevents fans from trading Pokémon over from Generation II, but the generation also made a large number of gameplay and mechanical advancements, such as introducing double battles, a more simpler EV and IV system, natures and abilities for Pokémon. In 2006, the Fourth Generation was ushered in by the Pokémon Diamond and Pearl versions for Nintendo DS, set in the Sinnoh region. It added 107 more new Pokémon, bringing the total to 493 species. Generation IV's gameplay was well praised for the physical and special split which made attacking moves based on what they do instead of what type it was and for introducing online battling and trading via Nintendo Wi-Fi Connection, both of which greatly helped the popularity of competitive play. In 2009, the generation also released the highly acclaimed Generation II remakes, Pokémon HeartGold and SoulSilver. Super Smash Bros. Brawl drew content from all four generations of Pokémon released at the time. In 2010, the Fifth Generation began with the release of Pokémon Black and White, also for Nintendo DS. Set in the Unova region, it brought in 156 species, the most of any individual Generation to the game and raised the total to 649. This generation also includes a sequel, Pokémon Black 2 and White 2, instead of a remake. Generation V was designed and marketed as a "new beginning" for the franchise; while its mechanical advancements from Generation IV were minimal, other changes were introduced such as older protagonists, a greater focus on story and characters, the first region based on a non-Japanese country (the New York-inspired Unova region), and (in Black and White) having a regional Pokédex purely consisting of new Pokémon. Many of these elements were highly praised upon release, but the lack of access to classic Pokémon in Black and White was criticized by some longtime fans of the series, resulting in the re-introduction of older Pokémon in Black 2 and White 2 and even more so in following generations. In 2013, the Sixth Generation began with the series' first-ever simultaneous worldwide release, Pokémon X and Y for the Nintendo 3DS - the games that marked the series' transition from 2D sprites to full 3D graphics and models. Set in the Kalos region, 72 new Pokémon were introduced, the fewest of any individual Generation, bringing the grand total to 721 recognized Pokémon species - but a brand new "Mega Evolution" mechanic also introduces dozens of all-new, temporary "super-forms" that Pokémon from previous generations may assume during battle. The generation also includes the Generation III remakes Pokémon Omega Ruby and Alpha Sapphire. Generation VI was highly praised for bringing the series to vivid 3D, as well as streamlining features such as competitive play, team preparation, and Pokémon catching and collecting; additionally, X and Y in particular endeared themselves to "old-school" fans by harkening back to Generation I in many ways. However, the generation was criticized by some for its low difficulty (a decision made in order to compete with mobile gaming), less substantial postgame, and more formulaic plots and characters. Super Smash Bros. 4 draws content from all six generations of Pokémon released at the time. In 2016, the Seventh Generation began with Pokémon Sun and Moon for the Nintendo 3DS, set in the Alola region. 81 new Pokémon were introduced, bringing the grand total to 802 recognized Pokémon species. In addition, a new mechanic called "Z-Moves" was introduced, allowing for each Pokémon to have access to special "finishing moves" that can only be used once per battle, and some Pokémon having Z-Moves exclusive only to them once they have the proper Z-Crystal. Select Pokémon from the first generation have also received exclusive redesigns called “Alolan forms” to cement the region’s distinct climate. Like Generation V before it, Sun and Moon have a greater focus on story and worldbuilding and attempt to break from the series's conventions in several ways. Chief among these changes are that Alola is introduced with no proper Pokémon League and the player must instead clear a series of trials to complete their "Island Challenge,” and that HMs were completely removed, eliminating the need to switch to a particular Pokémon for a specific technique at a specific time. All of these changes were lauded by critics and fans who felt that the franchise was finally taking strides into the current video game landscape after years of stagnation. Before release, Sun and Moon became the most preordered games in Nintendo’s history and afterwards becoming the fastest-selling games in the Americas, selling 14.69 million copies in a mere two months (nearly on par with the lifetime sales of previous games). Super Smash Bros. Ultimate incorporates content from across the series up to this generation. The next two games, Pokémon Ultra Sun and Ultra Moon, are 3DS expansions of this generation with five more Pokémon, bringing the grand total to 807. Following these games were remakes of Pokémon Yellow titled Pokémon Let's Go Pikachu! and Let's Go Eevee!, which were the first traditional Pokémon games for the Nintendo Switch. The game is, however, a major departure from the core-series formula, as the wild battle mechanics and random encounters had been removed in favor for a capturing system similar to the one in Pokémon GO. This change in gameplay and structure was intended to serve as a bridge for players between Pokémon GO and the mainline series as well as offer a more casual experience on its own. While these games limited the amount of Pokémon to the initial 151 (not including Alolan forms), two new Pokémon were introduced bringing the franchise total to 809. In 2019, the Eighth Generation begins with Pokémon Sword and Shield for the Nintendo Switch, set in the Galar region. Originally teased at E3 2017, this installment is notable for being the first time that a new core-series Pokémon generation was developed for a home console. Galar is an expansive region containing idyllic countrysides and contemporary cities, and the people and Pokémon work closer than ever to forge a living. The traditional Gym system from games prior to Sun and Moon was brought back for this installment. The Stadium series is a series of games that started in 1998 with Pokémon Stadium, with its most recent release being Pokémon Battle Revolution in 2006. The Stadium series is a battle series, taking the core aspect of the main series games, battling. The player could copy their Pokémon from Generations I and II (Stadium and Stadium 2) or from Generation IV (Battle Revolution) and use them as a party for battling NPCs in tournaments to win prizes that could be used for various gameplay features. Stadium 1 and 2 also featured a minigame mode and a Gym Leader Castle, two gamemodes that Battle Revolution lacked. The Pikachu series consists of two games: Hey You, Pikachu! and Pokémon Channel. In these games, the player interacts with Pikachu, performing daily activities with it, such as exploring, talking to other Pokémon, and playing minigames. Pokémon Channel's primary gameplay feature is TV, the player and Pikachu would watch TV to buy items to decorate their home, participate in quizzes and guessing games, and watch a Pichu Bros. special exclusive to the game. Hey You, Pikachu! used a special attachment to the Nintendo 64 called the "Voice Recognition Unit" (VRU for short), that allowed the player to be able to talk to Pikachu and to help better socialize with it. However, the VRU was calibrated for a high-pitched child's voice, leading to difficulties in playability for adolescents and adults. The PokéPark series also consists of two games, both released for the Wii. In this series, the player plays as Pikachu, and can explore the park known as PokéPark, and play minigames to build friendships with fellow Pokémon, in order to save PokéPark. The TCG series is a series of games based on the Pokémon Trading Card game, specifically the first few sets of the TCG. The gameplay of these games is very similar to that of the main series games, with the notable difference being battling with Pokémon Trading Cards rather than Pokémon themselves. The Pinball series is a series of games based on pinball respectively. Pokémon Pinball uses Pokémon from Generation I, while Pokémon Pinball: Ruby & Sapphire includes Pokémon from up to Generation III. The Puzzle series is based on the Tetris series, namely Tetris Attack. Pokémon Puzzle League, released for the N64, is based on the anime, while Pokémon Puzzle Challenge, released for the Game Boy Color, is not. The Colosseum series is a series taking place in an entirely original region known as Orre, where the player must protect Orre from the crime syndicate known as Cipher and capture Pokémon they had kidnapped and closed their hearts to, also known as Shadow Pokémon. In Pokémon XD: Gale of Darkness, the primary focus of the game is a completely black Lugia known as Shadow Lugia, or XD001, known by Cipher as the ultimate Shadow Pokémon and impossible to purify. The Mystery Dungeon series is a series based around Pokémon rather than a trainer. The player joins a team and explores dungeons recruiting Pokémon, completing missions, and solving the mystery of why the player turned into a Pokémon. The Ranger series is like the main series games, except instead of capturing Pokémon, the player uses a device known as a Capture Styler to befriend the Pokémon in order to win the battle. Instead of being called a Pokémon Trainer, the main characters in this series are named Pokémon Rangers, and their only goal is to save people and Pokémon alike from evil and destruction. The Rumble series is a very different game from the main series. In this series, the player takes control of what's called Toy Pokémon, and must traverse through mazes fighting different Pokémon, ultimately leading to a boss Pokémon at the end of the level. The player would also have a chance of collecting said Toy Pokémon after defeating them. The Trozei series is another puzzle game like Puzzle League, except instead of matching colored blocks, the player matches Pokémon. Pokémon Battle Trozei features Mega Evolutions. Pokkén Tournament is a fighting game developed by Bandai Namco that takes place on a three-dimensional plane, featuring various Pokémon as the playable characters. The game would later get an expanded version, Pokkén Tournament DX, which adds more playable Pokémon and introduces triple battles. Pikachu, Charizard, Mewtwo and Lucario, all playable in the Super Smash Bros. series, are also playable in this spinoff. Pokémon GO is a smartphone game developed by Niantic that uses augmented reality and GPS tracking to have the player explore the real world and catch and battle Pokémon in various locales. The game is notable for being one of the most successful smartphone apps and Nintendo-related games of all time, having been downloaded by over 100 million people worldwide and becoming a cultural phenomenon much like the franchise in its early days. Pokémon Duel is a smartphone game developed by Heroz that revived the abandoned Trading Figure Game. In this game, players fight each other using statues of Pokémon and cards that give them special powerups. Magikarp Jump is a smartphone game developed by Select Button that has a focus on Magikarp, known to be the weakest Pokémon. In this game, the player has to train up a Magikarp and use it to compete in Magikarp jumping contests. Pokémon Quest is a game for both the Nintendo Switch and smartphones developed by Game Freak. The game is set in a world where everything has a blocky, Minecraft-esque style to it. The player has to set up a camp that attracts and Pokémon, who are then used to explore the areas, gather materials, and defeat wild Pokémon. The Pokémon series' initial incarnation and set of releases were in effect when Super Smash Bros. was released in 1999, so only Pokémon from what is now referred to as the franchise's "first generation" are featured in the game. With two of the twelve playable characters in the game being Pokémon species themselves, the Pokémon franchise ties with the Mario series in having the most amount of characters available on the roster (and becomes the second most-represented series if one counts Donkey Kong and Yoshi as extensions of the Mario series). Mewtwo was originally planned to be a playable character, but was removed for unknown reasons. Pikachu: Registered as Pokémon #025 in the games' National Pokédex listing, Pikachu (name unchanged from the Japanese version) was introduced in the first generation of the franchise as an Electric-type Pokémon that is 0.4 m (1'4'') tall and weighs 6 kg (13.2 lbs). It is a yellow, vaguely anthropomorphic mouse-like species that stores electricity within pouches on its cheeks marked by red circular patterns, and is able to expel and shoot the electricity outward as its primary form of offense. It is regularly treated as the franchise's primary mascot, and is depicted and featured in virtually every Pokémon product, such as in the long-running anime wherein it is the favored partner of Pokémon trainer Ash Ketchum. As a not-fully-evolved species, it is not particularly powerful or durable in Pokémon battles in the RPG series by default, though it can evolve into the larger and more capable Raichu. The Second Generation introduced a younger "baby" form of Pikachu, Pichu, which a Pikachu or Raichu may produce while breeding, and which may evolve into a Pikachu of its own. In Super Smash Bros., Pikachu is characterized as a lightweight combatant that can move around the battlefield with good speed and dole out fast attacks, and yet also possesses some strong attacks of its own. In competitive play, Pikachu is considered to be the best playable character of Super Smash Bros. for having many advantages, including an effective blend of speed and power, good combo ability, and an enormously far-reaching method of recovery. Jigglypuff: Registered as Pokémon #039 in the games' National Pokédex listing, Jigglypuff (Purin in the Japanese version) was introduced in the First Generation as a pure Normal-type Pokémon (becoming dual Normal/Fairy-type in Generation VI) that is 0.5 m (1'8'') tall and weighs 5.5 kg (12.1 lbs). It is a pink, fluffy, spherical creature with a hypnotic singing voice capable of literally putting those around to hear it to sleep, which it uses as its method of self-defense against foes in Pokémon battles and in the wild. A wild Jigglypuff was a recurring character in the first two generations of the Pokémon anime, and was prone to getting insulted whenever its audience would fall asleep from its songs and would vandalize their faces with a marker. Much like Pikachu, Jigglypuff is weak in Pokémon battles in the RPG series, as it has a larger form named Wigglytuff with better combat statistics. It also received a baby form in the second generation named Igglybuff. In its at-the-time-unexpected debut as a playable fighter in Super Smash Bros., Jigglypuff is the lightest and floatiest character, and has various similarities to Kirby, including the ability to jump multiple times in midair. While it lacks a variety of attacks with good knockback, it has a lethal trump card in the form of its Rest ability. This is not enough, however, for it to be considered one of the better characters competitively. Saffron City: This stage is set on the rooftops of the skyscrapers in Saffron City, the largest metropolis in the Pokémon world's Kanto region. The central skyscraper in Saffron City belongs to Silph Co., a corporation that designs technologically advanced devices, and in the earliest Pokémon RPGs, the Pokémon crime syndicate Team Rocket takes over the building, and the player's character must enter it and defeat the Rockets in battle. The structure on the Silph Co. building in this stage routinely opens up and makes one of several Pokémon briefly appear to function as a stage hazard: Venusaur, Charmander, Electrode, Chansey, and Porygon. Poké Ball: The mass-producible, spherical item that, in any Pokémon continuity, can be thrown at a wild Pokémon to capture it and place it under the thrower's ownership, and which can subsequently be used by the owner as a storage device for that Pokémon that can send out and recall the Pokémon freely. The Poké Ball item featured in Super Smash Bros., like with each incarnation of the Poké Ball in future Smash Bros. installments, comes pre-loaded with one Pokémon randomly selected out of a pool of possible species, and when the ball is thrown and lands on a floor, the Pokémon inside emerges and briefly performs its own moves and behaviors before disappearing. The Super Smash Bros. version of this item can release one of thirteen different results, all originating from the first generation: Charizard, Blastoise, Beedrill, Clefairy, Meowth, Onix, Hitmonlee, Koffing, Chansey, Goldeen, Starmie, Snorlax, and most rarely, Mew. 12: An orchestration of the traditional Pokémon title theme, heard on Saffron City. 22: The victory fanfare of Pikachu and Jigglypuff is an orchestration borrowing elements from track 12. Following the release of the first Smash Bros., the Pokémon series entered its second generation in 1999, so Pokémon from the two existing generations at the time are featured in 2001's Super Smash Bros. Melee. While four of the 26 playable characters are Pokémon, the Pokémon series is now the third most-represented in the game, falling behind the five characters of The Legend of Zelda. Pikachu: Returning from Super Smash Bros., Pikachu gains Skull Bash as its new side special move, but otherwise retains its role as a fast character with and powerful attacks and a versatile recovery. However, Pikachu's aforementioned power and speed are weakened from Super Smash Bros., which together with the poor approach options it finds itself with in the competitive Melee environment causes Pikachu to be graded much lower on the Melee tier list than it was back in Smash 64. However, it still finds itself as a viable character to be reckoned with. Jigglypuff: Returning from Smash Bros., Jigglypuff gains Rollout as its new neutral special move, but otherwise retains its role as a seemingly "underpowered" character that is easy to knock out but is capable of both incredibly versatile recovery and a powerful trump card move in Rest. However, its overall attack power, attack speed, range, and midair jumping velocity are improved, and its Rest is both stronger and easier to combo into, such as the Space animal slayer, all of which prompt it to be competitively regarded as one of the best characters. Pichu: Registered as Pokémon #172 in the games' National Pokédex listing, Pichu (name unchanged from the Japanese version) was introduced in the second generation as a new "baby" stage in Pikachu's evolutionary line - a Pokémon that will hatch out of an egg produced by Pikachu that are left to breed at a daycare. It is an Electric-type Pokémon that is 0.3 m (1'0'') tall and weighs 2 kg (4.4 lbs). Like Pikachu, (which it can evolve into) Pichu can store electricity within its cheek pouches and expel it outward to attack, but unlike Pikachu, its inexperience with handling electricity often causes it to damage itself when attempting to unleash a strong electric attack. This does not carry over into the Pokémon RPGs as a game mechanic, but nonetheless, as a basic-stage species, it is extremely weak in Pokémon battles. In Super Smash Bros. Melee, there is no dispute that Pichu is an inferior clone of Pikachu, having similar moves across the board but being even easier to knock out. While some of its attacks and traits are actually slightly stronger and faster than Pikachu's, Pichu is crippled by many of its attacks actually adding damage to its own damage meter fairly quickly as a side effect. This leads it to be consistently considered the worst character competitively, or at least a candidate for the label. Mewtwo: Registered as Pokémon #150 in the games' National Pokédex listing, Mewtwo (name unchanged from the Japanese version) was introduced in the first generation as a Psychic-type Pokémon that is 2 m (6'7'') tall and weighs 122 kg (269 lbs). It is unique in the Pokémon setting because it is an individual lifeform that was created by humankind, cloned from the Pokémon Mew, and it possesses incredible powers that help categorize it alongside the various all-powerful Pokémon that are typically referred to as "Legendary Pokémon". A Mewtwo was the focus of the anime continuity's first movie and a direct-to-video follow-up, in which it was depicted as sapient and capable of telepathically projecting human language and was initially shown in a villainous role. In the RPG series, Mewtwo is one of the most overall powerful and threatening Pokémon to bring into battle against opponent trainers' Pokémon teams. However, its role in its debut appearance in Super Smash Bros. Melee is very different; it is a very odd blend of various attributes that excel and various other important attributes that are very lacking, and features multiple non-damaging utility moves and a chargeable projectile in Shadow Ball. Its lacking power, range, and speed in its attack options, its subpar resilience, and its highly situational special moves results in it being regularly considered close to being one of the worst competitive character choices. Additionally, Ditto makes an appearance as the graphic for a random character and color choice when setting up a Winner Out or Loser Out style tournament in the Tournament Mode. Super Smash Bros. Melee features two stages representing Pokémon, one starter and one unlockable. While the second generation of Pokémon games introduced the Johto region in which they initially take place, it may be noted that both of the following stages nonetheless take place in Kanto, the region that was the setting of the first generation. Kanto: Pokémon Stadium This takes place in a stadium that does not represent any one specific location in the Pokémon RPGs. Noteworthy about this stage is that the entire field routinely transforms into one of four entirely new themed battlefields. Kanto Skies: Poké Floats: This stage consists of many Pokémon-shaped balloons floating in the skies above the Kanto region. Over the course of three-and-a-half minutes, giant balloons of Squirtle, Onix, Psyduck, Chikorita, Weezing, Slowpoke, Porygon, Wooper, Sudowoodo, Snorlax, Venusaur, Seel, Wobbuffet, Goldeen, Lickitung, Chansey, Geodude, and many Unown appear in that order and cycle through for the players to battle on. In addition, a stage based on the Entei trophy is used as the battlefield for Event 26: Trophy Tussle 2. It is not accessible for multiplayer play. 15: Pokémon Stadium: An orchestration of the main title screen music in most Pokémon RPGs, complete with a chorus. It is heard in Pokémon Stadium. 16: Poké Floats: A synthesized medley of three battle-related tunes heard in the first generation of Pokémon RPGs, beginning with the standard Trainer Battle theme, then the Gym Leader Battle theme, and finally the wild Pokémon encounter theme. This is heard on Poké Floats and is often heard accompanying Mewtwo in single player mode. 32: Battle Theme: A synthesized medley of three battle-related tunes heard in the second generation of Pokémon RPGs, beginning with the wild Pokémon encounter theme, then the Gym Leader Battle theme, and finally the Champion Battle theme. This is heard as a secondary track on Pokémon Stadium and is often heard accompanying Pichu in Single-player mode. 45: Pokémon Victory: The victory fanfare of Pikachu, Jigglypuff, Pichu, and Mewtwo is an orchestration borrowing elements from track 15, "Pokémon Stadium". During the extended hiatus between Melee and Brawl, Pokémon proceeded with and completed its Third Generation, and had already begun its Fourth Generation in 2006-2007 when Brawl was released in 2008. Therefore, all four of the Pokémon generations at the time are represented in the Brawl package. While Pokémon-related characters occupy four slots on the 35-slot character roster of the game, the franchise effectively contributes six unique playable characters, the largest of any represented franchise if not compared to a combination of Mario, Donkey Kong, Yoshi, and Wario as one "overall" franchise; this is reflected in the Pokémon segment of the game's All-Star mode having the most opponents to fight. This is especially noteworthy because Pokémon is the only series to have more than one of its characters from Melee retired from Brawl, with the absence of both Pichu and Mewtwo in the roster. On the final character select screen (after all characters are unlocked), the Pokémon characters take up the seventh column. Pikachu: Pikachu returns from its Super Smash Bros. Melee appearance without any thematic changes to its core moveset. Its new Final Smash, Volt Tackle (named after a powerful exclusive attack it has in the RPGs), temporarily turns it into a giant, floating sphere of electricity that can be controlled and sent flying through the air, damaging any enemy it comes into contact with. Pikachu regains some of its excellent competitive standing with increased survivability, approach options, grab range, and damage with various attacks, despite some weaker smash attacks. Jigglypuff: Jigglypuff similarly returns from its Super Smash Bros. Melee appearance without any thematic changes to its core moveset. Its new Final Smash, Puff Up (which does not originate from the RPGs), renders Jigglypuff stationary and makes it grow to gargantuan proportions, and it eventually inflicts a massive pushback to all opponents that are too close and promptly deflates. Jigglypuff's prior strong attacks are now much weaker, especially Rest, which carries much less force and places more emphasis on it now causing the flower special condition. Despite retaining incredible air mobility, Jigglypuff has been graded to be one of the worst competitive characters in Brawl. Pokémon Trainer: A representation of a generic Pokémon trainer - the design of which matches the playable male trainer depicted in Pokémon FireRed & LeafGreen - makes for a mechanically unique character choice in Brawl; the player does not control him as a playable combatant, but rather a set of three unique Pokémon that belong to him, only one of which partakes in the match at any given point. Each of the three Pokémon are playable characters that can be freely swapped between with the Pokémon Change move and an associated set of mechanics, and the three share the same Triple Finish final smash, which launches three simultaneous beam attacks across the screen. While being a rotating set of three fighters, each with their own merits, causes the Pokémon Trainer to be a character choice that can bypass some problems other characters have with specific matchups against certain enemy characters, he is graded to be low-tier competitively because of particularly severe afflictions involved with the mechanic that punish him for not swapping Pokémon constantly - an issue compounded by the sluggish pace of the move. Squirtle: Registered as Pokémon #007 in the games' National Pokédex listing, Squirtle (Zenigame in the Japanese version) was introduced in the first generation as one of the three "starter" Pokémon the player may choose between at the start of games set in the Kanto region. It is a Water-type Pokémon that is 0.5 m (1'08'') tall and weighs 9 kg (19.8 lbs), and is able to evolve into Wartortle, which evolves into Blastoise. In its Brawl appearance, Squirtle is the smallest, lightest, and fastest of the three Pokémon overall, and is capable of spewing water and retreating into its shell for brief invulnerability. Ivysaur: Registered as Pokémon #002 in the games' National Pokédex listing, Ivysaur (Fushigisou in the Japanese version) was introduced in the first generation as the intermediate evolution stage of Bulbasaur, another of the three "starter" Pokémon the player may choose between at the start of games set in the Kanto region. It is a Grass/Poison dual-typed Pokémon that is 1.0 m (3'03'') tall and weighs 13 kg (28.7 lbs), and is able to evolve into Venusaur. A rare instance of a playable Smash Bros. character that is predominantly quadrupedal, Ivysaur can extend prehensile vines out of the plant on its back to whip enemies, and its budding back flower can release powerful attacks. In Brawl, it lacks the speed of Squirtle, and the sluggishness of its otherwise powerful smash attacks counterbalances its access to moves like Bullet Seed, which can rack up damage points very fast. Charizard: Registered as Pokémon #006 in the games' National Pokédex listing, Charizard (Lizardon in the Japanese version) was introduced in the first generation as the final evolution stage of Charmander, the last of the three "starter" Pokémon the player may choose between at the start of games set in the Kanto region. It is a Fire/Flying dual-typed Pokémon that is 1.7 m (5'07'') tall and weighs 90.5 kg (199.5 lbs), and is a viable contender in competitive play in the Pokémon RPGs themselves. In Brawl, Charizard is a heavyweight, fire-breathing character who, alongside Meta Knight and Pit, is one of the few characters capable of gliding with its wings, and has attacks with great power, great range, and even good speed, though they have high ending lag as well. Lucario: Registered as Pokémon #448 in the games' National Pokédex listing, Lucario (name unchanged from the Japanese version) was introduced in the fourth generation as a Fighting/Steel dual-type Pokémon that is 1.2 m (3'11'') tall and weighs 54 kg (119 lbs). Introduced as a mascot for the fourth generation, it is a bipedal canine Pokémon that is the evolved form of Riolu, and is capable of utilizing a spiritual force named "aura" to both improve its martial arts strength and react to its opponents' movements better. It has powerful and versatile offensive statistics and options in the Pokémon RPGs, but frail durability. Both its anime depiction and its appearance in Brawl show it to be capable of a similar kind of telepathic speech as Mewtwo. Lucario has a unique trait in its playable appearance in Brawl, wherein its attacks become stronger as it accumulates damage from enemy attacks, and its Final Smash, Aura Storm (another attack that does not appear in the RPGs themselves), unleashes an immense beam of energy through the stage that can be guided with the analog stick. With a strong aerial game to begin with, Lucario is comparatively high-tier in competitive play because its moves become very powerful and dangerous when it is at a high damage percentage, though it is primarily held back by its reliance on being damaged enough to attain this power to begin with. Rayquaza: Registered as Pokémon #384 in the games' National Pokédex listing, Rayquaza (name unchanged from the Japanese version) was introduced in the Third Generation as a Dragon/Flying dual-type Pokémon that is 7.0 m (23'00'') tall and weighs 206.5 kg (455.2 lbs). It is an incredibly powerful and legendary Pokémon that is the version mascot of the game Pokémon Emerald, appearing on that game's box art, and is depicted as a serpentine dragon that makes its home flying in the ozone layer of the planet; in stark contrast to this, Brawl depicts it as a territorial beast that slumbers at the bottom of a lake in the game's story mode, The Subspace Emissary. Rayquaza appears as a stage boss that Diddy Kong and Fox McCloud have to fight early in the story, and is featured in the Boss Battles mode like the rest of the game's bosses. Pokémon Stadium 2: An all-new counterpart to Melee’s Pokémon Stadium stage, which has a similar layout and transformation routine but transforms into four all-new themes. Cosmetically, other Pokémon will now appear in the background to each stage theme, unlike in the original stage: Dugtrio, Cubone, Hoppip, Skarmory, Drifloon, Electivire, Magnezone, Snover, and Snorunt. Spear Pillar: This unlockable stage is set at the ruins on the peak of the Sinnoh region's Mt. Coronet, an important location in the Fourth Generation of Pokémon games. Each time the stage is played, one of three legendary Pokémon from the Fourth Generation is selected to appear in the background and function as a stage hazard, launching powerful attacks at the fighters in the foreground: Dialga, Palkia, and Cresselia. Furthermore, the pixie-like Pokémon Mesprit, Azelf and Uxie appear when either Dialga or Palkia destroy a part of the stage. Pokémon Stadium: The original Pokémon Stadium makes a return appearance as part of Brawl’s collection of Melee Stages, with minor changes to the physics of the platforms that appear. Poké Ball: The Super Smash Bros. Brawl version of this item can release one of thirty different results, originating from all four Generations of the franchise that were in effect as of Brawl: Meowth, Electrode, Goldeen, Staryu, Snorlax, Chikorita, Togepi, Bellossom, Wobbuffet, Torchic, Gardevoir, Gulpin, Metagross, Latias and Latios (the first instance of a duo of separate Pokémon that can appear out of a single thrown Poké Ball), Piplup, Bonsly, Munchlax, and Weavile, and in rare instances, Moltres, Mew, Entei, Suicune, Lugia, Ho-Oh, Celebi, Kyogre, Groudon, Jirachi, Deoxys (in its Attack Forme), and Manaphy. See List of SSBB Music (Pokémon series). Pokémon Main Theme - A completely redone version of the original Pokémon main theme that was mostly used in the original Red & Blue versions, but isn't heard as often in the newer ones. It is used on the Pokémon Stadium 2 stage. Road to Viridian City (From Pallet Town/Pewter City) - A whimsical remix of one of the commonly used "Route" songs used in the Red & Blue versions, first heard on Route 1, which also has elements of the town music in Viridian. It is used on the Pokémon Stadium 2 stage. This song is also played during both Pokémon Trainer and Jigglypuff's 1-player mode credits. The Pokémon Center - A remix of the Pokémon Center background music that is used in nearly every Pokémon title. It is used on the Pokémon Stadium 2 stage. This song is also played during Pikachu's 1-player mode credits. Pokémon Gym/Evolution - A medley made of both the Pokémon Gym song as well as the evolution song, both of which have made regular appearances in every mainstream Pokémon title. It is used on the Pokémon Stadium 2 stage. Wild Pokémon Battle! (Ruby/Sapphire) - A remix of the background music that plays when encountering a wild Pokémon in the Ruby, Sapphire and Emerald versions. It is the theme of the Pokémon Stadium 2 stage. Victory Road - A guitar remix of the theme that originated at Victory Road and the Elite Four in the Ruby & Sapphire versions. It is used on the Spear Pillar stage. Dialga/Palkia Battle at Spear Pillar! - A medley consisting of remixes of both the Dialga & Palkia battle theme and the Spear Pillar background music from the Diamond & Pearl versions. It is the theme of the Spear Pillar stage. Wild Pokémon Battle! (Diamond/Pearl) - A remix of the background music that plays when encountering a wild Pokémon in the Diamond & Pearl versions. It is used on the Spear Pillar stage. Team Galactic Battle! - A remix taken directly from the Diamond & Pearl versions soundtrack. It is used on the Spear Pillar stage. This song is also played during Lucario's 1-player mode credits. Route 209 - A rather upbeat remix of the Route 209, 212 and 222 background music from the Diamond & Pearl versions. It is used on the Spear Pillar stage. Pokémon Stadium (Melee) - Taken directly from Melee. It is used on the Pokémon Stadium stage. Battle Theme (Melee) - Taken directly from Melee. It is used on the Pokémon Stadium stage. Poké Floats (Melee) - Taken directly from Melee. It is used on the Pokémon Stadium stage. Pokémon Victory Theme - Pikachu, Pokémon Trainer, Lucario and Jigglypuff's victory theme. A section of the Pokémon Red & Blue main theme. In the interim between the releases of Brawl and the Wii U and 3DS Smash Bros. games, the Pokémon franchise once again proceeded with and completed a full generation, Generation V, and had started Generation VI, which allows for content from all six Pokémon generations to be featured in the most recent Smash Bros. game. Among the introductions in Generation VI are new, temporary "Mega Evolutions" for certain Pokémon species such as Lucario, Charizard, and Mewtwo who returns as the first downloadable character in Smash Bros.
Pikachu: the Pokémon mascot was confirmed to be a playable character in Super Smash Bros. 4 at the game's initial showcase at E3 2013. The only apparent cosmetic change is that it is much more brightly colored, and its model continues the trend of gradually becoming less chubby, matching its appearances in the most recent Pokémon products. Pikachu has received a fair amount of both buffs and nerfs. Its overall moveset remains the same, including its Final Smash from Brawl, Volt Tackle. Jigglypuff: Jigglypuff was unofficially confirmed through a livestream leak on Twitch. Jigglypuff is an unlockable character in the 3DS version, while being a starter for the first time in the Wii U version. It is much more expressive than before and holds a permanent smile. Jigglypuff has been rebalanced from Brawl, but ultimately suffers more than in Brawl due to the game's new physics. While having quicker and more powerful attacks, its overall moveset is the same, including its Final Smash from Brawl, Puff Up. Mewtwo: Mewtwo was announced on October 23rd, 2014 in the Super Smash Bros. for Wii U: 50-Fact Extravaganza as the first downloadable character. It is the second character, after Dr. Mario, to skip one game and appear in the next. Like other returning Pokémon, its appearance now matches its current form in recent Pokémon media. Mewtwo has been buffed from Melee by gaining more mobility and power. It has also been given a Final Smash, where Mewtwo Mega-Evolves into Mega Mewtwo Y and uses Psystrike, a move that stuns opponents, then launches them via an intense mental shock. It was first made available on April 15, 2015 for users who registered both versions of Smash 3DS and Smash Wii U on Club Nintendo, then made available worldwide for purchase two weeks later on April 28. Charizard: Charizard returns as a fighter, and is now a standalone character choice from the Pokémon Trainer in Brawl, devoid of any special interaction with Squirtle and Ivysaur. Charizard has a new side special move called Flare Blitz, a powerful attack, though it inflicts recoil damage on Charizard even if it doesn't make contact with an opponent. Charizard's previous side special, Rock Smash, is now its down special instead. It also has a new Final Smash, Mega Charizard X, which enables Charizard to Mega-Evolve and fly around shooting fire blasts. Lucario: Lucario was the first Pokémon to be revealed as a playable starter character since Pikachu. Like many other characters from cartoonish franchises, Lucario's appearance is changed to stray away from the more realistic look from Brawl, into a much more vibrant and colorful look. Lucario gains a larger influence from his aura now, which affects moves like Aura Sphere and Extreme Speed more. Lucario has a new Final Smash, its Mega Evolution from X and Y, where Lucario can dish out almost twice as much damage and resist attacks. Greninja: registered as Pokémon #658 in the games' National Pokédex listing, Greninja (Gekkouga in the Japanese version) was introduced in Generation VI of Pokémon as the final evolution stage of Froakie, one of the three "starter" Pokémon the player may choose at the start of games set in the Kalos region. It is a Water/Dark dual-typed Pokémon and is regarded as one of the most viable contenders in the latest iteration of the main RPG series' competitive scenes. Greninja was confirmed as a newcomer in the April 8, 2014 Smash Bros. Direct. An amphibian warrior with a ninja-like aesthetic, Greninja's signature attack became its special move Water Shuriken, a chargeable physical attack. Its Final Smash is Secret Ninja Attack, where Greninja uses its other signature attack Mat Block to send foes in front of the moon, where it then slashes opponents several times before sending a final blow downward. Bold italics denotes an item new to the Smash Bros. series. The Pic of the Day revealing Xerneas, the first Poké Ball summon shown off for SSB4. Poké Ball (throwing/summon): a reoccurring capsule from the Pokémon series used to contain Pokémon. Like an Assist Trophy, the Poké Ball summons one of several Pokémon that will either aide the summoner or distort some aspect of the fight. Master Ball (throwing/summon): a rare Poké Ball model. In the Pokémon series, the Master Ball has a guaranteed catch rate and is usually reserved for rare and powerful Pokémon. This is reflected in Smash, where mostly rare, Legendary, or Mythical Pokémon can be summoned. The only exception is Goldeen. A bolded lowercase Mu "μ" denotes a Pokémon that can be summoned from a Master Ball. Bold italics denotes a Pokémon new to the Smash Bros. series. Meowth: a Scratch Cat Pokémon from Red and Blue. It uses Pay Day to attack opponents. Electrode: a Ball Pokémon from Red and Blue. It detonates with Explosion. Goldeen (μ): a Goldfish Pokémon from Red and Blue. It bounces around harmlessly using Splash. Staryu: a Star Shape Pokémon from Red and Blue. It homes in on a target and unleashes Swift. Eevee: an Evolution Pokémon from Red and Blue. It strikes opponents with Take Down. Snorlax: a Sleeping Pokémon from Red and Blue. It launches itself skyward and plummets towards the stage with Body Slam. Moltres (μ): a Flame Pokémon from Red and Blue. It uses Fly and damages opponents with its fiery wings. Mew (μ): a New Species Pokémon from Red and Blue. It passively uses Fly to exit the stage, dropping a Custom Part or trophy. Togepi: a Spike Ball Pokémon from Gold and Silver. It uses a Metronome to summon a random infliction. Bellossom: a Flower Pokémon from Gold and Silver. It puts opponents to sleep with Sweet Scent. Entei (μ): a Volcano Pokémon from Gold and Silver. It unleashes a pillar flames with Fire Spin. Suicune (μ): an Aurora Pokémon from Gold and Silver. It strikes opponents with an icy Aurora Beam. Lugia (μ): a Diving Pokémon from Gold and Silver. Strikes opponents with Aeroblast. Gardevoir: an Embrace Pokémon from Ruby and Sapphire. It encircles itself in a Reflect barrier that deflects projectiles. Metagross: an Iron Leg Pokémon from Ruby and Sapphire. It shakes the ground with Earthquake. Latias and Latios (μ): Eon Pokémon from Ruby and Sapphire. They fly back-and-forth and strike opponents with Steel Wing. Kyogre (μ): a Sea Basin Pokémon from Ruby and Sapphire. It blasts opponents away with Hydro Pump. Deoxys (μ): a DNA Pokémon from Ruby and Sapphire. It rises to the top of the stage and unleashes Hyper Beam. Abomasnow: a Frost Tree Pokémon from Diamond and Pearl. It strikes opponents with Blizzard and Ice Punch. Palkia (μ): a Spatial Pokémon from Diamond and Pearl. It flips the camera perspective upside-down with Spacial Rend. Giratina (μ): a Renegade Pokémon from Diamond and Pearl. It strikes opponents with Dragon Breath. Darkrai (μ): a Pitch-black Pokémon from Diamond and Pearl. It pulls in opponents with Dark Void and puts them to sleep. Arceus (μ): an Alpha Pokémon from Diamond and Pearl. It slams airborne opponents downward with Gravity. Victini (μ): a Victory Pokémon from Black and White. It uses Victory Star to grant fighters a 1.5× attack boost and armor. Snivy: a Grass Snake Pokémon from Black and White. It strikes opponents with Razor Leaf. Oshawott: a Sea Otter Pokémon from Black and White. It rams into opponents with Surf and pulls them off of the stage. Zoroark (μ): an Illusion Fox Pokémon from Black and White. It claws opponents with Fury Swipes. Kyurem (μ): a Boundary Pokémon from Black and White. It blasts opponents with Icy Wind. Keldeo (μ): a Colt Pokémon from Black and White. It slices opponents with Secret Sword. Meloetta (μ): a Melody Pokémon from Black and White. It release projectile music notes with Echoed Voice. Genesect (μ): a Paleozoic Pokémon from Black and White. It releases a powerful beam with Techno Blast. Chespin: a Spiny Nut Pokémon from X and Y. It releases explosive nuts with Seed Bomb. Fennekin: a Fox Pokémon from X and Y. It spits out balls of fire with Incinerate. Fletchling: a Tiny Robin Pokémon from X and Y. It passively bounces around the stage hitting opponents with Peck. Spewpa: a Scatterdust Pokémon from X and Y. It paralyzes opponents with Stun Spore. Gogoat: a Mount Pokémon from X and Y. It charges opponents with Take Down and can be ridden by the summoner. Swirlix: a Cotton Candy Pokémon from X and Y. It slows down movement with Cotton Spore. Inkay: a Revolving Pokémon from X and Y. It trips opponents with Topsy-Turvy. Dedenne: an Antenna Pokémon from X and Y. It strikes opponents with a powerful Discharge. Xerneas (μ): a Life Pokémon from X and Y. It uses Geomancy to increase knockback on all attacks, particularly for the summoner. Substitute Doll (Green): a green Pokémon plushie. if a tour item specifically targets this item's user, it is redirected to a random other player. Like Boss Galaga and Tingle, it can also be used to exclude the user from the effect of an item that affects all players. The Substitute Doll otherwise appears as a part of Greninja's moveset. Snorlax (Blue): a Sleeping Pokémon from Red and Blue. It temporarily makes the user impossible to launch away on the map, be it from other items or from being defeated. Snorlax otherwise appears as a Poké Ball summon. Latias and Latios (Red): Eon Pokémon from Ruby and Sapphire. They allow the user to choose an opponent to be their teammate in battle. They otherwise appear as a Poké Ball summon. Darkrai (Red): a Pitch-black Pokémon from Diamond and Pearl. It puts an opponent to sleep at the start of battle. It otherwise appears as a Poké Ball summon. Koffing: a Poison Gas Pokémon from Red and Blue. In Smash Run, Koffing releases a gaseous Smokescreen that reduces the stats of all opponents trapped in it. In Smash Tour, its Smokescreen hides the board for one turn. It previously appeared as a Poké Ball summon in the original Super Smash Bros. Enemies exclusive to the 3DS version. They appear in Smash Run. Gastly: a Gas Pokémon from Red and Blue. As a spectral entity, it can only be struck by projectile attacks. Petilil: a Bulb Pokémon from Black and White. Similar to Bellossom, it causes nearby opponents to fall asleep by releasing Sleep Powder. Chandelure: a Luring Pokémon from Black and White. It launchs fireballs and attacks using Fire Spin. It absorbs fire and darkness-based attacks, strengthening its own flames. Cryogonal: a Crystallizing Pokémon from Black and White. It attempts to freeze opponents with an icy blue laser. Prism Tower (starter): staged on floating platforms that travel to various areas on the titular tower; the Pokémon Gym of Lumiose City from Pokémon X and Y. Like Isle Delfino and Skyloft, the primary platform brings the fight to various areas about the exterior of Prism Tower. Like Battlefield, the stage has a day-to-night cycle. Magnemite, Zapdos, Emolga, Helioptile, and Yveltal occasionally cameo in the background, but do not influence the battle. It is one of the possible stages to appear in Level 7 of All-Star Mode as a home stage for Greninja. Its Ω form is a spacious floating platform like Final Destination. Unova Pokémon League (starter): staged at the foot of Unova's Pokémon League from Pokémon Black and White. N's Castle occasionally erupts from the League in the background, causing ramps to appear on both sides of the stage. A spiritual successor to Brawl's Spear Pillar, either Reshiram or Zekrom occasionally appear to wreak havoc on the stage. Reshiram sets the stage ablaze, while Zekrom electrifies it. Either Milotic, Shaymin, or Whimsicott will occasionally appear in place of Reshiram and Zekrom, but they do not interfere with the stage. It is one of the possible stages to appear in Level 5 of All-Star Mode as a home stage for Pikachu, Charizard, Jigglypuff, and Mewtwo. Jigglypuff is unlocked on this stage. Its Ω form is columnar. Blazing Chamber: a Fire-type chamber. Tall flames emit from the bottomless pits, and the two floating platforms are supported by pillars of fire that inflict damage on contact. Blaziken, Infernape, Tepig, and Pyroar cameo in the background. Occasionally, Ho-Oh appears to intensify the flames. Flood Chamber: a Water-type chamber. Ramps with walk-off platforms appear on the sides of the main platform, where a rush of flood waters erupt from the sides to push fighters towards the blast zone. Blastoise, Piplup, Wailord, and Clawitzer cameo in the background. Occasionally, Manaphy appears and transforms the main platform into a whirlpool. Ironworks Chamber: a Steel-type chamber. The hilts of two massive swords serve as the two floating platforms, and a pool of liquid metal manifests center-stage. Any fighter that touches the pool becomes metal. Scizor, Steelix, Klinklang, and Honedge cameo in the background. Occasionally, Registeel appears and will flip the swords. Dragonmark Chamber: a Dragon-type chamber. A large, masonic dragon on the back wall summons pillars of purple flames on the stage. Dragonite, Garchomp, Axew, and Hydreigon cameo in the background. Occasionally, Rayquaza flies in from the side of the stage, inflicting damage on contact. It is the only phase to lack any Pokémon introduced in Pokémon X and Y.
Kalos Pokémon League's Ω form is columnar and can accommodate 8-Player Smash. It is one of the possible stages to appear in Level 1 of All-Star Mode as a home stage for Greninja. An Electric phase resembling a factory. The floor is a conveyor belt that pushes fighters and items off the arena. Magnezone and Electivire cameo in the background. A Ground phase resembling a fossil dig site. A tall mound serves as a platform. Dugtrio and Cubone cameo in the background. A Flying phase resembling a wind farm. Gusts of wind are pushed upward from underground vents, distorting gravity. Hoppip, Skarmory, and Drifloon cameo in the background. An Ice phase that resembles a glacial development. The floor is covered with ice, making movement slippery. Snorunt and Snover cameo in the background. Pokémon Stadium 2 is unlocked once the "When Lightning Strikes" event is completed. It is one of the possible stages to appear in Level 3 of All-Star Mode as a home stage for Pikachu, Charizard, Jigglypuff, and Mewtwo. It is large enough to accommodate 8-Player Smash. Pokémon Stadium 2's Ω form lacks the floating platform and does not transform. Battle! (Wild Pokémon) (Pokémon Diamond / Pokémon Pearl): an arrangement of "Battle! (Wild Pokémon)" from Diamond and Pearl. It plays on Pokémon Stadium 2. Battle! (Champion) / Champion Cynthia: an arrangement containing "Battle! (Champion)" and "Champion Cynthia" from Diamond and Pearl. It plays on Kalos Pokémon League and is featured on Disc 2 of A Smashing Soundtrack. Route 10: an arrangement of "Route 10" from Black and White. It plays on Kalos Pokémon League and is featured on Disc 2 of A Smashing Soundtrack. N's Castle Medley: a medley of pieces from Black and White associated with N's Castle, including "N's Room", "N's Castle", and "ENDING ~To Each Future~". It plays on Unova Pokémon League and Kalos Pokémon League. It is featured on Disc 1 of A Smashing Soundtrack. Battle! (Reshiram/Zekrom): an arrangement of "Battle! (Reshiram/Zekrom)" and "Dragonspiral Tower" from Black and White. It plays on Unova Pokémon League and Kalos Pokémon League. Route 23: an arrangement of "Route 23" from Black 2 and White 2. The referenced composition itself includes an arrangement of "Introduction" from Diamond and Pearl. It plays on Kalos Pokémon League. Battle! (Team Flare): a remix of "Battle! (Team Flare)" from X and Y. It plays on Kalos Pokémon League and is featured on Disc 2 of A Smashing Soundtrack. Battle! (Trainer Battle) (Pokémon X / Pokémon Y): an arrangement of "Battle! (Trainer Battle)" from X and Y. It plays on Prism Tower and Kalos Pokémon League. It was featured in the trailer "Challenger from the Shadows" and is included on Disc 1 of A Smashing Soundtrack. Pokémon Stadium: an orchestral arrangement of "Title Screen" from Red and Blue; the main theme of the Pokémon series. It is similar to another arrangement of the same piece used in early seasons of the Pokémon anime. It plays on Pokémon Stadium 2. Poké Floats: a medley of battle themes from Red and Blue, including "Battle! (Trainer Battle)", "Battle! (Gym Leader Battle)", and "Battle! (Wild Pokémon)". It plays on Pokémon Stadium 2. Pokémon Stadium 2: a medley of battle themes from Gold and Silver, including "Battle! (Wild Pokémon)", "Battle! (Gym Leader Battle)", and "Battle! (Champion)". It plays on Pokémon Stadium 2. Pokémon Main Theme: an arrangement of "Title Screen" from Red and Blue; the main theme of the Pokémon series. It plays on Pokémon Stadium 2. The first few bars are featured in the trailer "Challenger from the Shadows". Road to Viridian City (From Pallet Town/Pewter City): an arrangement of "Road to Viridian City: Leaving Pallet Town" from Red and Blue. It plays on Pokémon Stadium 2. Pokémon Center: a flourished arrangement of "Pokémon Center" from Red and Blue. It plays on Kalos Pokémon League. Pokémon Gym / Evolution: an arrangement of "Pokémon Gym" and "Evolution" from Red and Blue. It plays on Pokémon Stadium 2. Battle! (Wild Pokémon) (Pokémon Ruby / Pokémon Sapphire): an arrangement of "Battle! (Wild Pokémon)" from Ruby and Sapphire. It plays on Pokémon Stadium 2. Victory Road (Pokémon Ruby / Pokémon Sapphire): an arrangement of "Victory Road" from Ruby and Sapphire. It plays on Pokémon Stadium 2. It is featured in the trailer "Mewtwo Strikes Back!" Battle! (Team Galactic): an arrangement of "Battle! (Team Galactic)" from Diamond and Pearl. It plays on Kalos Pokémon League. Route 209: an arrangement of "Route 209 (Day)" from Diamond and Pearl. It plays on Kalos Pokémon League. Battle! (Dialga/Palkia) / Spear Pillar: an arrangement of "Battle! (Dialga/Palkia)" and "Spear Pillar" from Diamond and Pearl. It plays on Kalos Pokémon League. Compositions and arrangements directly sourced from Pokémon series with no alterations. Lumiose City: sourced from Pokémon X and Y. It plays on Prism Tower and is one of the few pieces exclusive to the Nintendo 3DS version. Battle! (Wild Pokémon) (Pokémon X / Pokémon Y): plays on Kalos Pokémon League. Victory Road (Pokémon X / Pokémon Y): plays on Kalos Pokémon League. Battle! (Champion) (Pokémon X / Pokémon Y): plays on Kalos Pokémon League. Victory! Pokémon Series: an orchestration of the first few bars of the "Pokémon Main Theme". The completed "Beginning of Pokémon" Trophy Box. The Pokémon franchise has been greatly expanded to include a substantial amount of content from the more recent seventh generation, starting with Sun and Moon, such as a new playable character, many new Poké Ball summons, many Spirits, and new music tracks. This is on top of all of the previous Pokémon fighters returning (including 3 cut veterans) and most of the summons, stages, and music tracks from the previous installments as well. Pikachu: The mascot of the franchise returns as a starter fighter, and this time it comes in both male and female variants, including Pikachu Libre from Pokémon Omega Ruby and Alpha Sapphire. During the transition, Pikachu received a new neutral air that has a drag down effect and is great for combos. Aside from that, Pikachu's down air now spikes, and its mobility had been increased, making it a better character than it was before. Pikachu's Final Smash, Volt Tackle, no longer needs user input once the final smash is activated. Jigglypuff: The Balloon Pokémon returns as an unlockable fighter after being a starter in Super Smash Bros. for Wii U. It has been substantially buffed in its transition to take greater advantage of its aerial prowess, and many of its worst moves such as Sing and Rollout have been altered to be more effective. Rest also received a buff to its endlag, making it harder for opponents to counterattack after they respawn. Pichu: After a lengthy absence after its debut in Melee, the Tiny Mouse Pokémon returns once more as an unlockable fighter. It's more expressive than its Melee counterpart and has even received new voice clips. It has also gained several new alternate costumes (including the female spiky-eared Pichu), a new taunt, a Final Smash that's the same a Pikachu's, and an on-screen appearance. As before, it still inflicts recoil damage on all of his electricity attacks, however the recoil damage had been reduced, and it also slowly increases Pichu's knockback thanks to rage. Overall, it's been heavily buffed compared to Melee, and is considered to be one of the best characters in the game. Mewtwo: The man-made legendary and clone of Mew returns as an unlockable fighter after appearing as DLC in Smash 4. Many attack animations such as its tilts and throws have been reworked from the past installment, although mostly for the worst. Mewtwo's recovery options have also been nerfed during the transition thanks to the new air dodge mechanics and the removal of Confusion's horizontal momentum boost. Pokémon Trainer: Last seen in Brawl, he returns as an unlockable fighter. This time, alternate costumes based on Leaf, the female Pokémon Trainer from FireRed and LeafGreen, can be selected as well. As a major buff, the Pokémon Trainer no longer is plagued with the Stamina mechanic that forces one to switch to another Pokémon due to its attacks being weaker. As such, it's now easier and faster to switch from one Pokémon to another and allows the option to stick with said Pokémon without forcing the player to choose another. Squirtle: The Tiny Turtle Pokémon returns as one of the 3 playable Pokémon after its absence from Smash 4, getting much more expressive since its appearance from Brawl. Some attacks such as jab and Withdraw have been reworked and it even received new voice clips, however the character has overall been nerfed and is no longer considered to be the trainer's best Pokémon. Ivysaur: The Seed Pokémon also returns as one of the 3 playable Pokémon after its absence from Smash 4, also being more expressive than Brawl, while alsoreceiving new voice clips.. Ivysaur had received massive buffs, with some moves such as Vine Whip being reworked to be more effective, and some of its moves being retooled to work better. The mechanics of the game, such as the lack of edgehogging and the removal of the type-effectiveness mechanic, also indirectly helped Ivysaur. Overall, Ivysaur is considered by many to be the trainer's best Pokémon. Charizard: After a stint as a separate character in the previous game, the Flame Pokémon returns to its original status as one of the 3 playable Pokémon for the Trainer. A direct consequence of this reversion is that Charizard lost its Rock Smash, which removed a defensive mechanic that it originally had at the trade-off of now being able to switch out. Charizard himself had been granted a mobility buff and an improved recovery, but had lost some of its best tools from Smash 4, including the aforementioned Rock Smash. Lucario: The Aura Pokémon returns as an unlockable fighter after being a starter in Smash 4. One major difference is that he reverted back to his old Final Smash, Aura Storm, while still keeping his Mega Lucario appearance from the previous titles. While Lucario's mobility have been increased, his aura mechanic had been nerfed with the removal of the Anubis Combo and the weakening of rage. Greninja: After being a starter in Smash 4, the Ninja Pokémon returns as an unlockable fighter. Its Final Smash is functionally identical to before, but now features it turning into Ash-Greninja, a special form that first appeared in the anime and subsequently appeared in Generation VII. The ability to tech out of a footstool severely harms Greninja's footstool combos from Smash 4, however Greninja's impressive mobility had been increased, most of its formerly situational moves such as down smash and Water Shuriken have been improved, and all of its aerials have less lag, which improve its combo game nonetheless. Incineroar: Registered as Pokémon #727 in the series's National Pokédex listing, Incineroar (Gaogaen in the Japanese version) was introduced in Generation VII as the final evolution of Litten, the fire starter that the player can choose in the Alola region. Incineroar is a dual Fire/Dark type and is classified as the "Heel Pokémon", in tune with its portrayal as a heel wrestler. It was the final newcomer in the game's base roster, revealed on November 1st, 2018. Incineroar is a heavyweight fighter and mostly relies on pro-wrestling moves. For certain attacks, each time it successfully connects on their opponents it strikes a pose which can be cancelled out. Poké Ball: like Assist Trophy characters, the Pokémon released from Poké Balls can now attack each other if summoned by opposing fighters. Master Ball: can summon only rare and Legendary Pokémon and much like Assist Trophy characters, the Pokémon released from Master Balls can now attack each other if summoned by opposing fighters. All Pokémon stages from past games aside from Poké Floats return. This is the first game with no new Pokémon stage, only retro stages. Saffron City: After nearly two decades of absence, the city from Kanto returns in Ultimate. The stage retains it's original feel from Smash 64, but is updated to be less pixelated overall, and the "Silph" on the side of one of the buildings is now spelled as "Sylph". Charmander, Venusaur, Electrode, Chansey, and Porygon still appear as stage hazards. Pokémon Stadium: After being absent in Smash 4, this iconic stadium returns. The visual graphics have been updated alongside other Melee stages, and all of its transitions return. Pokémon Stadium 2: The Brawl sequel to Pokémon Stadium returns in Ultimate. The stadium has been saturated a bit, with it no longer displaying a bluish tint across the background. In addition, the screen in the background is much larger than the previous games this stage was featured in. Spear Pillar: Last seen in Brawl, the peak of Mount Coronet returns as a retro stage after a 10-year absence. The tint of the stage that indicated whenever Dialga, Palkia, or Cresselia appears no longer matters. The stage itself is more darker and shadowy than its Brawl counterpart. Unova Pokémon League: This stage the location of the climactic finale of Black and White, returns from the 3DS version of Smash 4. The visual graphics have been updated hugely during its transitions, and is now more dark and ominous than it's previous incarnation. Reshiram, Zekrom, Whimsicott, Milotic, and Shaymin all return along with the stage. Prism Tower: The tallest tower and gym of Lumiose City also returns from the 3DS version of Smash 4. As before, the stage has a day-to-night cycle, and its design has been updated to be more detailed than before. Kalos Pokémon League: Kalos's incarnation of the Pokémon League returns from the Wii U version of Smash 4. As before, the stage may transform into the four different Elite 4 chambers, and all the Pokémon that appear in the chambers also return. It's design had also been updated to be more sharp and vibrant than its predecessor. Pokémon received 8 new tracks for Ultimate, a majority of them from Pokémon Sun and Moon. "Battle! (Steven)": A new arrangement of the Hoenn champion battle theme from Pokémon Omega Ruby and Alpha Sapphire, which itself is a remix of the same theme from Pokémon Ruby and Sapphire Versions. "Battle! (Lorekeeper Zinnia)": An electric guitar-laden remix of Zinnia's battle theme from the post-game Delta Episode of Pokémon Omega Ruby and Alpha Sapphire. "Battle! (Wild Pokémon) - Pokémon Sun / Pokémon Moon": A new arrangement of the theme when battling Wild Pokémon from Pokémon Sun and Moon. "Battle! (Trainer) - Pokémon Sun / Pokémon Moon": A new arrangement of the theme when battling against normal trainers from Pokémon Sun and Moon. "Battle! (Island Kahuna)": A new remix of the theme that plays when battling an Island Kahuna from Pokémon Sun and Moon. "Battle! (Gladion)": A new remix of the theme when battling Gladion from Pokémon Sun and Moon. "Battle! (Elite Four) / Battle! (Solgaleo / Lunala)": A new arrangement of the theme when fighting the Elite Four and the theme when fighting Solgaleo or Lunala from Pokémon Sun and Moon. "The Battle at the Summit! ": A new remix of the Champion theme from Pokémon Sun and Moon. Arrangements and remixes from previous Smash games. "Main Theme - Pokémon Red & Blue (64)": A remix of the opening theme from Pokémon Red and Blue Versions. Returns from Smash 64. "Main Theme - Pokémon Red & Blue (Melee)": An orchestrated arrangement of the Pokémon Main Theme, from Pokémon Red and Blue Versions. Returns from Melee, renamed from "Pokémon Stadium". "Pokémon Red / Pokémon Blue Medley": A medley of tracks from Pokémon Red and Blue Versions, including "Battle! (Trainer Battle)", "Battle! (Gym Leader Battle)" and "Battle! (Wild Pokémon)". Returns from Melee, renamed from "Poké Floats". "Pokémon Gold / Pokémon Silver Medley": A medley of tracks from Pokémon Gold and Silver Versions, including "Battle! (Wild Pokémon—Johto Version)", "Battle! (Gym Leader—Johto Version)", and "Battle! (Champion)". Returns from Melee, renamed from "Battle Theme" in Melee and Brawl, and "Pokémon Stadium 2" in Smash 4. "Main Theme - Pokémon Red & Blue (Brawl)": An arrangement of the opening theme from Pokémon Red and Blue Versions. Returns from Brawl. "Road to Viridian City - Pokémon Red / Pokémon Blue": An arrangement of the Route 1 theme and the Viridian City from Pokémon Red and Blue Versions. Returns from Brawl. "Pokémon Gym/Evolution - Pokémon Red / Blue": An orchestrated remix of the music that plays in Pokémon Gyms, and the Evolution Theme. Returns from Brawl. "Battle! Wild Pokémon - Pokémon Ruby / Pokémon Sapphire": An orchestrated remix of the music that plays when encountering a non-legendary wild Pokémon from Pokémon Ruby and Sapphire Versions. Returns from Brawl. "Battle! (Wild Pokémon) - Pokémon Diamond / Pokémon Pearl": An arrangement of the theme when battling Wild Pokémon from Pokémon Diamond and Pearl Versions. Returns from Brawl. "Battle! (Team Galactic)": A remix of the music that plays when battling a Team Galactic grunt from Pokémon Diamond and Pearl Versions. Returns from Brawl. Route 209 - Pokémon Diamond / Pokémon Pearl: A piano-based remix of the them when exploring Route 209 and Route 212 from Pokémon Diamond and Pearl Versions. Returns from Brawl. "Battle! (Dialga / Palkia) / Spear Pillar": An arrangement of the music played that played when fighting Dialga or Palkia, and the background music of Spear Pillar, from Pokémon Diamond and Pearl Versions. Returns from Brawl. "Battle! (Champion) / Champion Cynthia": An arrangement containing the themes when encountering and battling Champion Cynthia, from Pokémon Diamond and Pearl Versions. Returns from Smash 4. "N's Castle": A medley of tracks from Pokémon Black and White Versions, including "N's Room", "N's Castle", and "ENDING ~To Each Future~". Returns from Smash 4. "Battle! (Trainer Battle) - Pokémon X / Pokémon Y": An arrangement of the theme when battling normal trainers from Pokémon X and Y. Returns from Smash 4. "Route 10 - Pokémon Black / Pokémon White": A Latin-style remix of the music heard on Route 10 from Pokémon Black and White Versions. Returns from Smash for Wii U. "Route 23 - Pokémon Black 2 / Pokémon White 2": A remix of the music heard on Route 23 from Pokémon Black and White Versions 2. Returns from Smash for Wii U. "Battle! (Team Flare)": A remix of the theme that plays when battling a member of Team Flare from Pokémon X and Y. Returns from Smash for Wii U. Tracks sourced from the Pokémon games. "Battle! (Wild Pokémon) - Pokémon X / Pokémon Y": The theme that plays when battling a wild Pokémon, sourced from Pokémon X and Y. "Lumiose City": The track played when exploring Lumiose City, sourced from Pokémon X and Y. "Victory Road - Pokémon X / Pokémon Y": The theme that plays on Victory Road, sourced from Pokémon X and Y. "Battle! (Champion) - Pokémon X / Pokémon Y": The theme that plays during the battle against Diantha, sourced from Pokémon X and Y. "Victory! Pokémon Series": An orchestration of the first few bars of the "Pokémon Main Theme" from Pokémon Red and Blue Versions. Abridged from Brawl and Smash 4. Pikachu and Jigglypuff debuted in these games and have been playable in all Super Smash Bros. titles. Quick Attack and Thunder, moves used by Pikachu, originated in these games. Pound, Rest and Sing, moves used by Jiggypuff, originated in these games. Mewtwo, one of the Legendary Pokémon from these games, has been playable in Melee, SSB4 and Ultimate. Pikachu has an alternate costume in which it wears a hat based on Red, the main protagonist from these games. Jigglypuff has an alternate costume in which it wears a headband reminiscent of the Blackbelt Trainer class which debuted in these games. Pichu has an alternate costume in which it wears goggles reminiscent of the Swimmer Trainer class which debuted in these games. Pikachu later adopts these goggles in Brawl and SSB4 before they are returned to Pichu in Ultimate. Skull Bash, a move used by both Pikachu and Pichu, originated in these games. Agility, a move used by Pichu, originated in these games. Confusion, Teleport and Disable, moves used by Mewtwo, originated in these games. The male Pokémon Trainer debuted in these games (though he is shown using his design from FireRed and LeafGreen). The Pokémon he controls, Squirtle, Ivysaur and Charizard, also debuted in these games. Though Charizard has appeared in every game since Brawl, the others were absent in SSB4. Jigglypuff has an alternate costume resembling the Bug Catcher Trainer class, which debuted in these games. Squirtle and Charizard have alternate costumes resembling Wartortle and Charmeleon respectively, who debuted in these games. Double Team, a move used by Lucario, originated in these games. Water Gun, Withdraw, Waterfall and Hydro Pump, moves used by Squirtle, originated in these games. Vine Whip, Razor Leaf and Solar Beam, moves used by Ivysaur, originated in these games. Flamethrower, Fly and Fire Blast, moves used by Charizard, originated in these games. Charizard has alternate costumes resembling Charmeleon, Aerodactyl and Zubat/Golbat, who all debuted in these games. Hydro Pump and Substitute, moves used by Greninja, originated in these games. Also, Double Team is used during one of Greninja's victory poses. Thunder Wave and Thunder Shock, custom special variants of Pikachu's Thunder Jolt, originated in these games. Headbutt, a custom special variant of Charizard's Rock Smash, originated in these games. Saffron City, one of the largest cities in the Kanto region, appears as a stage in SSB and Ultimate. Butterfree, Fearow, Pidgey, Moltres, Porygon, Chansey, Charmander, Electrode and Venusaur appear as stage elements on Saffron City. Squirtle, Onix, Psyduck, Weezing, Slowpoke, Porygon, Snorlax, Venusaur, Seel, Chansey, Goldeen, Lickitung and Geodude appear on Poké Floats. Cubone and Dugtrio appear on Pokémon Stadium 2 during the Ground transformation. Dragonite and Blastoise appear on Kalos Pokémon League during the Dragon and Water transformations respectively. Substitute Doll and Snorlax appear as items in Smash Tour. Beedrill, Blastoise, Chansey, Charizard, Clefairy, Goldeen, Hitmonlee, Koffing, Meowth, Mew, Onix, Snorlax and Starmie. Articuno, Electrode, Moltres, Staryu, Venusaur, Weezing and Zapdos. Koffing appears as an ememy in Smash Run and Smash Tour. Gastly appears as an enemy in Smash Run. Bulbasaur, Venusaur, Charizard, Squirtle, Blastoise, Clefairy, Meowth, Poliwhirl, Electrode, Weezing, Chansey, Goldeen, Staryu, Ditto, Eevee, Snorlax, Articuno, Zapdos, Moltres, Mew, Misty, Poké Ball and Professor Oak. Bulbasaur, Charmander, Cubone, Dugtrio, Electrode, Goldeen, Gyarados, Meowth, Mew, Mewtwo, Moltres, Snorlax and Staryu. Meowth, Electrode, Goldeen, Staryu, Eevee, Snorlax, Moltres, Mew and Master Ball. Gastly, Magnemite, Zapdos, Hitmonlee and Articuno. Blastoise, Dragonite and Substitute Doll. Electrode, Goldeen, Meowth, Mew, Moltres, Snorlax and Staryu. Venusaur, Charmander, Blastoise, Metapod, Pidgey, Arbok, Sandshrew, Clefairy, Vulpix, Dugtrio, Meowth, Psyduck, Arcanine, Abra, Machamp, Geodude, Rapidash, Slowpoke, Magneton, Farfetch'd, Gengar, Electrode, Cubone, Hitmonlee, Weezing, Chansey, Kangaskhan, Goldeen, Staryu, Pinsir, Tauros, Gyarados, Lapras, Ditto, Eevee, Porygon, Articuno/Zapdos/Moltres, Dragonite and Mew. Pokémon Red / Pokémon Blue Medley (formerly Poké Floats) - contains arrangements of "Battle! (Trainer)", "Battle! (Gym Leader / Elite Four)", and "Battle (Wild Pokémon)" from these games. Pikachu has two alternate costumes based on two colors of nicknamed Pikachu from this game. Jigglypuff has two alternate costumes based on two colors of nicknamed Jigglypuff from this game. Mewtwo has two alternate costumes based on two colors of Mewtwo from this game. Pokémon Stadium, which appears in Melee, Brawl and Ultimate, was inspired by this game. The models used for the titular floats in Poké Floats were ripped straight from this game and its sequel. Pokémon Stadium 2, which appears in Brawl, Wii U and Ultimate was inspired by this game. Squirtle's blue alternate costume is reminiscent of its battle sprite from this game. Pichu, a playable fighter in Melee and Ultimate, made its debut in these games. Mewtwo has an alternate costume mostly resembling its Shiny coloration, which debuted in these games. Rollout, a move used by Jigglypuff, originated in these games. Shadow Ball, a move used by Mewtwo, originated in these games. Squirtle and Ivysaur have an alternate costume resembling its Shiny coloration, and Charizard has an alternate costume resembling the Shiny colorations of its pre-evolved forms, all of which debuted in these games. Extreme Speed, a move used by Lucario, originated in these games. Rock Smash, a move used by Charizard, originated in these games. Pikachu has an alternate costume resembling its Shiny coloration, which debuted in these games. Charizard has an alternate costume resembling its Shiny coloration, which debuted in these games. Pichu has an alternate costume in which it wears a Focus Band, an item which debuted in these games. The male Pokémon Trainer has an alternate costume resembling Ethan, the male protagonist from these games. Squirtle and Ivysaur have alternate costumes resembling their in-game battle sprites from these games. Cross Chop, a move used by Incineroar, originated in these games. While no stage from these games has appeared in a Super Smash Bros. game, a stage based on Sprout Tower, which debuted in these games, was planned to appear in Melee. Chikorita, Wooper, Sudowoodo, Wobbuffet and Unown appear as Pokéfloats on the titular stage. Scizor and Ho-Oh appear as stage elements on Kalos Pokémon League during the Steel and Fire transformations respectively. Bellossom, Celebi, Chikorita, Cyndaquil, Entei, Ho-Oh, Lugia, Porygon2, Raikou, Scizor, Suicune, Togepi, Unown. Chikorita, Cyndaquil, Totodile, Crobat, Cleffa, Igglybuff, Togepi, Bellossom, Marill, Sudowoodo, Unown, Wobbuffet, Steelix, Scizor, Heracross, Porygon2, Raikou, Entei, Suicune, Lugia, Ho-Oh and Celebi. Bellossom, Celebi, Chikorita, Entei, Ho-Oh, Lugia, Suicune, Togepi and Wobbuffet. Chikorita, Togepi, Ampharos, Marill, Sudowoodo, Wooper, Unown, Wobbuffet, Steelix, Scizor, Heracross, Skarmory, Houndoom, Smeargle, Miltank, Raikou/Entei/Suicune, Tyranitar, Lugia, Ho-Oh and Celebi. Pokémon Gold / Pokémon Silver Medley (formerly Battle Theme and Pokémon Stadium 2) is a medley of different tracks from Gold and Silver including "Battle! (Wild Pokémon)", "Battle! (Gym Leader / Johto Elite Four)", and "Battle! (Champion / Red)". Though no playable character from these games appears, there is a hypothesis that Plusle and Minun were originally planned to be playable characters, according to scrapped data in Brawl. Jigglypuff has an alternate costume in which it wears a hibiscus reminiscent of the hibiscus worn by Phoebe, a member of the Elite Four in these games. Volt Tackle, a move used by Pikachu and later Pichu, originated in these games. Bullet Seed, a move used by Ivysaur, originated in these games. Pikachu has an alternate costume in which it wears a Choice Band, an item that debuted in these games. Hyper Voice, a custom special variant of Jigglypuff's Sing, originated in these games. Blast Burn, a custom special variant of Charizard's Flare Blitz, originated in these games. Pichu has an alternate costume in which it wears a Team Aqua bandana, first worn by the Team Aqua members who debuted in these games. Revenge, a move used by Incineroar, originated in these games. Snorunt appears on Pokémon Stadium 2, during the Ice transformation. Milotic appears on Unova Pokémon League. On Kalos Pokémon League, Wailord appears during the Water transformation, Blaziken appears during the Fire transformation, Registeel appears during the Steel transformation and Rayquaza appears during the Dragon transformation. Latias/Latios appear as an item in Smash Tour. Deoxys, Gardevoir, Groudon, Gulpin, Jirachi, Kyogre, Latias/Latios, Metagross and Torchic. Rayquaza, introduced in these games, appears as a boss in The Subspace Emissary. Blaziken, Deoxys, Gardevoir, Groudon, Gulpin, Jirachi, Kyogre, Latios/Latios, Metagross, Mudkip, Plusle/Minun, Rayquaza, Snorunt, Torchic and Treecko. Deoxys, Gardevoir, Groudon, Gulpin, Jirachi, Kyogre, Latias/Latios, Metagross, Rayquaza and Torchic. Blaziken, Gardevoir, Shedinja, Flygon, Milotic, Absol, Salamence, Metagross, Latias/Latios, Kyogre, Groudon, Rayquaza, Jirachi and Deoxys. Battle! (Steven) originally appeared in these games, despite being officially sourced from Omega Ruby and Alpha Sapphire. The male Pokémon Trainer's design is based on Red's design from these games. The Pokémon Trainer has an alternate costume in which his clothes have a similar coloration to Leaf, the female protagonist from these games. Jigglypuff has an alternate costume in which it wears the same hat that Leaf wears. The Pokémon Trainer now has alternate costumes based on Leaf. Pikachu has an alternate costume in which it wears the same headband worn by Brendan, the male protagonist from this game. The Pokémon Trainer has an alternate costume in which his clothes resemble those worn by Brendan. The female Pokémon Trainer has an alternate costume in which her clothes resemble those worn by May, the female protagonist from this game. Mewtwo has an alternate costume whose color scheme matches Shadow Lugia, the main Pokémon from this game. Lucario, who debuted in these games, is a playable character in Brawl, SSB4 and Ultimate. Aura Sphere and Force Palm, moves used by Lucario, originated in these games. Flare Blitz, a move used by Charizard, originated in these games. Shadow Sneak, a move used by Greninja, originated in these games. Fire Fang and Dragon Rush, custom special variants of Charizard's Flamethrower and Flare Blitz respectively, originated in these games. The male Pokémon Trainer has an alternate costume in which he wears clothes resembling Lucas, the male protagonist from these games. Incineroar has an alternate costume resembling Infernape, who debuted in these games. Spear Pillar, a core setting in these games, appears as a playable stage in Brawl and Ultimate. Dialga, Palkia and Cresselia appear as major stage elements on Spear Pillar, while Uxie, Mesprit and Azelf appear in the background of the aforementioned stage. On Pokémon Stadium 2, Electivire and Magnezone appear during the Electric transformation, Snover appears during the Ice transformation and Drifloon appears during the Flying transformation. Shaymin appears on Unova Pokémon League. On Kalos Pokémon League, Garchomp appears during the Dragon transformation, Piplup and Manaphy appear during the Water transformation and Infernape appears during the Fire transformation. Darkrai appears as an item in Smash Tour. Bonsly, Manaphy, Munchlax, Piplup and Weavile. Abomasnow, Arceus, Darkrai, Giratina and Palkia. Azelf, Bonsly, Buneary, Chimchar, Cresselia, Darkrai, Dialga, Drifloon, Electivire, Glaceon/Leafeon, Magnezone, Manaphy, Mesprit, Munchlax, Palkia, Piplup, Riolu, Snover, Starly, Turtwig, Uxie and Weavile. Piplup, Garchomp, Abomasnow, Rotom, Uxie/Mesprit/Azelf, Dialga, Palkia, Regigigas, Giratina (Altered Forme), Cresselia, Phione, Darkrai, Shaymin (Land Forme) and Arceus. Giratina (Origin Forme) and Shaymin (Sky Forme). Pikachu has an alternate costume in which he wears the hat that Ethan, the male protagonist from these games, wears. Pichu has an alternate costume resembling Spiky-eared Pichu, who made its video game debut in these games. The female Pokémon Trainer features an alternate costume based on Hilda, the female protagonist from these games. Psytrike, a move used by Mewtwo, originated in these games. Unova Pokémon League appears as a stage in the 3DS version of SSB4 and Ultimate, with N's Castle from the finale of Black and White rising up in the background. Reshiram, Zekrom and Whimsicott appear as background characters on Unova Pokémon League. On Kalos Pokémon League, Hydreigon and Axew appear during the Dragon transformation, Tepig appears during the Fire transformation and Klinklang appears during the Steel transformation. Genesect, Keldeo, Meloetta, Oshawott, Snivy, Victini and Zoroark. Petilil, Chandelure and Cryogonal appear as enemies in Smash Run. Victini, Snivy, Oshawott, Zoroark, Kyurem, Keldeo, Meloetta and Genesect. Petilil, Chandelure, Croyogonal, Whimsicott, Emolga, Reshiram, Zekrom and Audino. Victini, Oshawott, Zoroark, Chandelure, Hydreigon, Cobalion/Terrakion/Virizion, Tornadus, Thundurus, Reshiram, Zekrom, Kyurem, Keldeo, Meloetta (Aria Forme) and Genesect. Landorus (Therian Forme), Kyurem (Black Kyurem), Kyurem (White Kyurem) and Keldeo (Resolute Forme). Greninja is a playable character in SSB4 and Ultimate. Pikachu has an alternate costume resembling its appearance in these games. This same alternate costume also features Pikachu wearing a hat and glasses reminiscent of the Red Outdoors Cap and Wide-Frame Glasses, which are worn by Calem, the male protagonist from these games. Jigglypuff has an alternate costume in which it wears a hat reminiscent of the one worn by Nurse Joy in these games. Jigglypuff has another alternate costume in which it wears a cap and glasses reminiscent of the Red Felt Hat and Wide-Frame Glasses worn by Serena, the female protagonist from these games. Water Shuriken, a move used by Greninja, originated in these games. Mat Block, a move used by Greninja to initiate Secret Ninja Attack, originated in these games. Lucario, Mewtwo and Charizard are capable of Mega Evolution during their Final Smash, with Lucario's and Mewtwo's returning in Ultimate. The male Pokémon Trainer has an alternate costume resembling Calem with tanned skin. Prism Tower, the central city in Kalos, is a playable stage in the 3DS version of SSB4 and Ultimate. Kalos Pokémon League appears as a playable stage in the Wii U version of SSB4 and Ultimate. Helioptile and Yveltal appear as background characters on Prism Tower. On Kalos Pokémon League, Pyroar appears during the Fire transformation, Honedge appears during the Steel transformation and Clawitzer appears during the Water transformation. Chespin, Dedenne, Fennekin, Fletchling, Gogoat, Inkay, Spewpa, Swirlix and Xerneas. Helioptile, Yveltal, Pokémon Trainer (Pokémon X & Y) and Professor Sycamore. Pyroar, Honedge, Clawitzer, Mega Kangaskhan, Mega Mewtwo X & Y and Mega Blaziken. Chespin, Aegislash, Inkay, Dedenne, Xerneas, Yveltal, Zygarde (50% Forme), Diancie, Hoopa (Confined), Volcanion, Mega Charizard X, Mega Kangaskhan, Mega Mewtwo Y and Mega Lucario. Interestingly, this is the only game in the series to provide directly ported music for the Super Smash Bros. series. Pikachu has an alternate costume based on Pikachu Libre, who debuted in these games. Pikachu Libre, Primal Kyogre, Primal Groudon, Mega Diancie and Hoopa (Unbound). Incineroar, the final evolution of the fire type starter of Litten, is a playable character in Ultimate. Greninja transforms into Ash-Greninja, who made its video game debut in these games, during its Final Smash in Ultimate. Pikachu has an alternate costume in which it wears the hat worn by Selene, the female protagonist from these games. Pichu has an alternate costume in which it wears the Team Skull bandana, first worn by Team Skull members from these games. Darkest Lariat, a move used by Incineroar, originated in these games. Also, Max Malicious Moonsault, Incineroar's Final Smash, is a more power version of Malicious Moonsault from these games. Bewear, Alolan Exeggutor, Lunala, Marshadow, Mimikyu, Pyukumuku, Alolan Raichu, Scizor, Solgaleo, Tapu Koko, Togedemaru and Alolan Vulpix. Alolan Raichu, Alolan Vulpix, Alolan Exeggutor, Zygarde (Complete Forme), Rowlet, Bewear, Pyukumuku, Togedemaru, Mimikyu, Tapu Koko, Solgaleo, Lunala, Nihilego, Necrozma and Magearna. League Title Defense / Battle At The Summit! Pokémon Trainer has an alternate costume based on Selene's design from these games. Partner Pikachu and Partner Eevee (available in a post-launch update and can be automatically obtained by having their corresponding game on the same Nintendo Switch as Ultimate). The Pokémon and Mario universes are the only universes to have multiple characters in all Super Smash Bros. games. The Kirby universe was originally planned to have two, as King Dedede was planned for the original Super Smash Bros.. The Pokémon universe is tied with the Legend of Zelda universe for most fighters introduced in one game, with each universe introducing four fighters in one game. One of the bonuses in Melee, "Rocket KO", is a reference to the Team Rocket trio in the Pokémon anime, who are often seen unhappily "blasting off" into the distance at the end of the episode. The bonus is awarded for Star KO-ing all members of an enemy team. Pokémon is the only series to have more than one character dropped between installments: Mewtwo and Pichu from Melee to Brawl, and Squirtle and Ivysaur from Brawl to Smash 4. Pokémon is the only universe that appeared in Smash 64 to have a new fighter in each following installment. The Pokémon universe has the most playable characters in the whole series and in a single game, with 10 so far in Ultimate. However, if one were to group the Pokémon Trainer's Pokémon collectively as a singular character, the total would be 8 and be surpassed by the Mario universe by one, which would make the Pokémon universe ahead of the Fire Emblem universe by 1. Although the Mario franchise technically has more with a total of 14 characters if one were to count the sub universes of the series (Donkey Kong, Yoshi and Wario). The Pokémon series has had six playable characters both in Brawl and SSB4. Super Smash Bros. for Wii U is the only game in which no playable Pokémon character is unlockable. Super Smash Bros. 4 is the first game to not introduce more than one new playable Pokémon. None of the playable Pokémon are of the Ice, Bug, Rock, Ground, Ghost, or Dragon type, unless one counts Mega Charizard X for Dragon type in Smash 4. While the elements of the Pokémon universe in the Super Smash Bros. series draw mainly from the games, there are also certain elements drawn from the anime, including the fact that some Pokémon's speech consists basically of them repeating their own names, while certain others (such as Mewtwo and Lucario) communicate via telepathic human-like speech, and also Goldeen's uselessness, which is based on Misty's Goldeen from the anime. The Misty trophy in Melee is also based on the character's design in the anime. Also, Pichu sustains damage from his electrical attacks, referencing the short Pikachu and Pichu Pikachu short in Pokémon 3: The Movie. Apart from the announcer, Pokémon is the only universe to have characters voiced in languages other than English and Japanese in the first three games, due to the many languages that the Pokémon anime series has been consistently dubbed into. This also makes it the only universe in the Smash series to have had characters voiced in Korean (in Brawl). Every Super Smash Bros. game has introduced at least 1 playable Pokémon that is part of a Starter Pokémon's evolutionary line. (Although Pichu is unavailable in all core series games in which Pikachu is a Starter Pokémon). As of Ultimate, the third and fifth generations of Pokémon are the only ones without a playable Pokémon in Smash. So far, Pokémon has introduced at least one newcomer in every game who was also the most recently debuted character in their respective installment in at least one point. Pikachu and Jigglypuff are the most recent characters in Smash 64, debuting in 1996. Not counting Roy (who had yet to appear in a game at the time), Pichu is the most recent character in Melee, debuting in 1999. Lucario is the most recent character in Brawl, debuting in 2006. Prior to the addition of Corrin via DLC, Greninja was the most recent character in Smash 4, debuting in 2013. Incineroar is the most recent character in Ultimate, debuting in 2016. Ultimate is the only installment without a new Pokémon stage. This page was last edited on April 3, 2019, at 23:57.